I have noticed that on the NHL website, starting from this year, there are not only standings in league, conferences and divisions (which used to be there last year, too), but also some kind of ranking which is called wild card. What are this standings for? How are teams divided there? The top three teams in each division will make-up the first 12 teams in the playoffs. The remaining 4 teams (Adding up to 16 teams) will be made up by the next two highest-placed finishers in each conference. Two teams per conference. 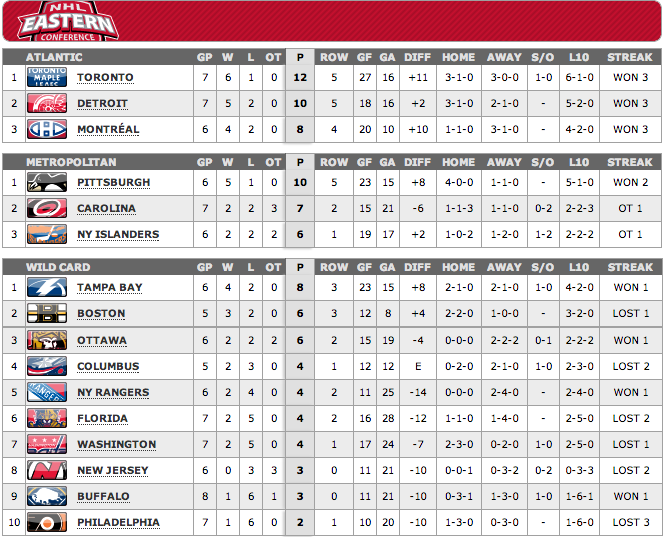 One team from the Atlantic and one team from the Metropolitan. The division winner with the second-most points in the conference will play the wild-card team with the second fewest points. In the picture below showing the current standings of the Eastern Conference, you can see that the top 2 rows consist of 3 teams for each division. If the season ended today, these 6 teams (3 from the Atlantic Division and 3 from the Metropolitan Division) will make the playoffs. In the third row, you see a list of every other team in the conference. The top 2 teams in this list are "Wild Card" teams and will also make the playoffs. Not the answer you're looking for? Browse other questions tagged ice-hockey nhl ranking or ask your own question.